Paizo recently revealed support books for their upcoming Iron Gods Adventure Path, the Technology Guide and People of the Stars. This came hot on the heels of an official blog post revealing the authors for Iron Gods and the titles of each of its six parts. I'm beyond excited to see all of this information coming out now and my anticipation for the release of Iron Gods has simply blown up! The Encounter Table is fortunate enough to have been able to sit down with Paizo's Creative Director James Jacobs, the mastermind behind Iron Gods, to talk about the upcoming sci-fi/fantasy Adventure Path as well as his history with RPGs as well as a few glimpses into the future. Please note, portions of this interview discuss the plot elements of Iron Gods and contain spoilers about the identity of the Adventure Path's antagonists. So read on, if you dare, and discover the secrets of the Iron Gods! Robert Brookes: Thank you, James, for making the time for this interview. For our readers who might not be familiar with you and your work, tell us a little about yourself and what you do for Paizo Inc.
James Jacobs: No problem! Thanks for asking! I’m the Creative Director at Paizo—that means I’m the one who basically sets a lot of the themes and stories that we tell about Golarion. I approve all of the products we publish, help outline many of them, develop and edit some of them as needed, and help to ensure that our increasing number of licensed products maintain the right feel and flavor for Golarion, such as the comic books, the miniatures, Pathfinder Online, and several really exciting new things in the works that I can’t yet talk about. Beyond my duties as Creative Director, a big part of my job is also to serve as the “champion” for the Adventure Path product line. I outline and develop and assign and brainstorm every other Adventure Path we publish, with Rob McCreary handling the other half of that job and Adam Daigle handling the bulk of the support articles. There’s a lot more to the job as well, but that’s more or less it in a nutshell. RB: What got you into tabletop gaming? JJ: My 5th grade teacher did. He split our class up into several adventuring parties and had us each make up a character to go on the quest for the King’s missing power sword. I made a dwarf wizard… one of the very few times I’ve ever made a dwarf character, in fact. My teacher was using a very heavily modified version of D&D's blue book rules to run the game. He let us keep track of our gold with what was basically paper gold coins, for example, and when I cast spells, I had to pay for the spellcasting by giving him the cost of the gold. He’d run the groups, one at a time, through the dungeon he drew on a big sheet of poster board, one room per session over the course of a lunch period. Once a group’s lunch period dungeon room exploration was over, that group couldn’t play again until someone in the party wrote up that session’s adventures as a short story. And since there were multiple groups of us exploring the dungeon simultaneously and only one power sword to find, that meant that if your group slacked and no one wrote up the session, you fell behind and had an increasingly small chance of finding the sword. My group lucked out in that I loved writing, and I pretty much wrote every single chapter of our adventures out with the exception of the third one. As a result, our group played the most often. And at the end of it all, after we confronted the lord of the land of the dead and ended up having to fight our way back into our living bodies, my character was the one who finally managed to grab the power sword and return it to the King! All in all, it was a pretty ingenious way to get a bunch of 5th grade kids to write and do math and learn about cooperation and more. In my case, it pretty much gave me a lifelong career. RB: Paizo has supported getting both young people and adults unfamiliar with RPGs into Pathfinder with the introduction of the Beginner's Box. Do you think there's more that Paizo can do to reach out to younger, more inexperienced players to attract them to the game? JJ: Absolutely… but it’s just as important for gamers themselves to do this as well; to teach their children or nephews or nieces to enjoy gaming. The Beginner’s Box is certainly the biggest thing we've done in this arena… and we have some stuff in the works for other solutions but I can’t really say much more about those yet. RB: You've mentioned in the past how working for Dungeon and Dragon magazines, as you did during Paizo's run with the publications, was a dream job and the realization of a childhood goal. Now that there's a gulf of time between today and the magazines ending their print run, how do you feel when you look back at your time with those magazines? JJ: I look back at my time working on the magazines with a combination of pride, nostalgia, fondness, and melancholy. I got my first adventure published in Dungeon back in issue 12—I was 14 or 15 years old at the time. I continued writing for Dungeon on and off for the next several years, and finally getting hired to be Dungeon’s Associate Editor was a dream come true. Especially considering I’d applied for that same job or a very similar job a half dozen times before over the previous several years, only to be passed over for someone with more experience than me. In the end, I was involved with Dungeonas an editor, be it either the entry-level Associate Editor on up to the overlord role of Editor-in-Chief, for about a third of its print run. That’s a pretty good legacy, and I’m incredibly proud of it. RB: Of everything you accomplished while working on Dungeon and Dragon magazine, what are you most proud of? JJ:That’d be a tie, I guess. Helping to bring Maure Castle to life was huge—I got to work with Rob Kuntz and Gary Gygax on that one, while getting to add a lot of my own ideas to it as well. But I think the thing I’m most proud of is Savage Tide. I’d been a part of all the Adventure Paths, starting by writing the 2nd part of Shackled City and then going on to help orchestrate and outline and build them all in one way or another. But Savage Tide was the first Adventure Path that was pretty much all my brainchild, with a fair amount of help and sage advice from Erik Mona, of course! RB: How different was the development of Adventure Paths for Dungeon and Dragon magazine compared to how they're developed now for Pathfinder? JJ: We do a lot more work in preparing and supporting the Adventure Paths for Pathfinder, and do them more often, so the big difference is a matter of scale and time. The Pahtfinder ones are flat out more difficult to do, in other words… but they’re also a lot more fun since we can do what we want without having to worry about getting approvals from outside of Paizo when we want to try something strange or risky or edgy. RB: Paizo has become an industry juggernaut in just a few short years, an accomplishment few publishers can claim to have achieved. During the early years of Paizo's independent publishing and the development of Pathfinder, what was one of the biggest challenges you faced, and how did you overcome it? JJ: Becoming an industry juggernaut is easier if your industry is a relatively small or niche one in the first place, so that certainly helped! But the biggest challenge we faced in those early years of Pathfinder was that of earning customer trust and support. During our time with the magazines, folks loved what we were doing, but most people didn’t know Paizo was its own thing—they just assumed that Wizards of the Coast was responsible for the contents of the magazines. With Pathfinder, we had to prove ourselves all over again—that we could do the same job we were already doing. No, scratch that. We had to prove we could do that job even better! So much better that folks would stick with us because of us, not because of a brand name. When we first started on Pathfinder’s first Adventure Path (and remember, at that point, the Adventure Path was Pathfinder), we had no guarantee that we’d still be in business long enough to release part six of Rise of the Runelords. So we did pretty much everything we could do to make sure that we had as many opportunities to succeed. Now, here we are, starting to seriously wonder how we’re going to fit a 3 digit number on the spine of Pathfinder #100 in the increasingly near future! RB: Will we be seeing anything special for AP # 100? JJ: Yes, but I’m not ready to reveal what that special thing is gonna be yet. RB: The upcoming Iron Gods Adventure Path delves into the long-standing mysteries surrounding the technological nation of Numeria, a fan favorite region of the Pathfinder campaign setting. What was the biggest challenge in getting to this point where Paizo is comfortable telling stories that challenge the traditional fantasy norms? JJ: The biggest challenge was patience. I’ve wanted to do the Iron Gods Adventure Path for years, but it’s not one we could have just started at any time. We had to have the right combination of system maturity, customer interest, in-house interest from management, and the ability to add several support books to other lines to present all of the new rules we’d need. Add to that the fact that I’m only doing one of each year’s Adventure Paths (not that Rob would do a bad job with it at all… he’d do a great job with Numeria—but I wanted it for myself! ), and the opportunities to do the campaign were relatively small. It’s been a long time coming, but it feels great to finally be off and running with it! RB: With the reveal of the Technology Guide Paizo has opened the door for a wealth of exploration in the area of fantasy and sci-fi fusion. What was one of the biggest driving points behind the development of this book? JJ: The need to create all the rules to support Iron Godswas the biggest point. Without thei Technology Guide, a significant portion of each volume of Iron Gods would have needed to be sacrificed for this material, which would have meant losing out on some adventure content and some cool articles—stuff like city gazetteers, the ecology of the android, deity articles, or an investigation of the Technic League would have had a very real chance of never happening if we’d had to publish all the basic rules for lasers and force fields and radiation and the like in there. Further, we would have had to reprint all that information, since it’s part of our philosophy to present as much of the info as we can in the book you need it. By putting these rules into their own book, the Technology Guide, we solve both of those problems. The rules are all there in their own book, and we’ll be putting all those rules up for free on the PRD soon after publication so that they’ll be there for fo lks to access and reference during play even if they haven’t bought the actual book itself. Of course, we hope you do still buy the book! You’ll miss out on the excellent artwork and all the fun flavor text if you don’t! RB: Will the rules from the Technology Guide be finding their way into the core line in the future? Would you like to see 3rd-party support material for these rules? JJ: We often transition rules from the softcover books into hardcovers, so there’s certainly a precedent set for that type of thing. A big hardcover book about science fiction games in a world-neutral format would be really cool, but those types of RPGs tend to sell much less than fantasy RPGs for whatever reason. Furthermore, it’d be a book for a type of game we don’t really support, so it’d be a weird case of going against Paizo’s philosophy of “we make books you AND we use.” So while it’s certainly possible, I wouldn’t say it’s likely at this point. And yes, I’d love to see 3rd party support material for the rules. That’s kind of the whole point of doing open games like Pathfinder… everyone gets to add to the rules! RB: What kind of material can we expect to see in the Technology Guide? JJ:The book’s backbone is a hefty chapter about technological items. We’ve got weapons (ranged and melee, mostly ranged), armor, pharmaceuticals, cybernetic implants, and all sorts of miscellaneous technological items. Chainsaws and monofilament whips! Laser rifles and railguns! Rocket launchers and nuclear resonators! Id rifles and atom guns! Force fields and magnetic boots! And much, much more! The book’s other chapters present rules for technological artifacts (things that go beyond even what a normal technological item can do, such as nuclear reactors or powered armor), new feats, new uses for old skills, new spells, new archetypes, a new prestige class (the technomancer, which is one more or less custom built for the Technic League), rules for hazards like radiation and what happens when old technology glitches, and more. It’s a lot of material, and it only really scratches the surface, but it lays the groundwork so we can continue to expand upon the ideas and concepts during the entire course of Iron Gods. RB: The Paizo blog recently showcased artwork for an alien spacecraft. Will we see rules for starships or space-based combat in the technology guide? JJ: Nope. That’s well beyond the scope of Iron Gods and the Technology Guide. Iron Gods is pretty much entirely planet-bound. RB: Some readers may be unaware of this, but you have a personal project called Unspeakable Futures that you have been working on for years that is a sci-fi campaign setting. Now, you've said before on the Paizo forums that the technology rules featured in Iron Gods (not to mention the robot subtype rules in the Inner Sea Bestiary) transitioned from this personal project. Is there anything else in Unspeakable Futures that you'd like to see make its way to Pathfinder? JJ: In fact, robots and the technological items aren't the only things that have migrated to Pathfinder from Unspeakable Futures. That game also has a gunslinger class, and it was the first draft of the one that ended up in Ultimate Combat. The two classes are pretty different now, though—the Unspeakable Futures one is more about a character who uses advanced weapons, after all, and didn't have the grit mechanic at all. Another element that made the jump was the android race. As for other elements… I’d love to see more Lovecraftian stuff come in, particularly creatures and elements created by other authors like Ramsey Campbell, Clark Ashton Smith, Robert Bloch, Robert E. Howard, and more. For a home game, I don’t have to worry about copyright issues, but for publication, that stuff starts getting complicated. There’s a lot more in Unspeakable Futures as well, including vehicle combat rules, new races like half-ghouls and deep one hybrids, a lot of monsters, some prestige classes and base classes, and more… but a lot of that stuff is really not appropriate at all for Golarion and works much better in a post-apocalyptic setting. And frankly, at this point, I think that the next time I do a significant bit of work on Unspeakable Futures, I’d like it to be the game itself. RB: People have asked before if you ever intend on developing Unspeakable Futures using a springboard like Kickstarter to fund its development. Is this something you'd be interested in pursuing? What challenges exist that might hinder such a development? JJ: I think that using Kickstarter to fund Unspeakable Futures would be successful. In fact, I think it’d be very successful, and it’s certainly something I’d be interested in pursuing. That said, I've seen lots of RPG kickstarter projects bloom into unexpected fortune only to crash and burn, and even the few that we’ve been directly involved with here in Paizo end up being a lot of work. Running a kickstarter and delivering what you promised is essentially a full-time job. And I've already got one of those. At this point, a kickstarter Unspeakable Futures is more in the category of “something to do after I retire from Paizo” than it is “something I want to do instead of sleeping for a year.” That does mean that there’s a real chance that by the time I have the time to do Unspeakable Futures up as a product, folks will have lost interest and the time to strike will have passed… but that’s life. Anyway… who knows what the future might bring? RB: People of the Stars was the other major Iron Gods tie-in supplement recently revealed. Following on the heels of Distant Worlds and Rasputin Must Die this feels like a natural expansion of the Pathfinder universe. What are you most excited about people discovering in this book? JJ: In a lot of ways, books like Distant Worlds and Rasputin Must Die were very specific choices meant to “test the waters” for something like Iron Gods. Had folks not reacted with such overwhelmingly positive reviews and responses to those types of books, chances are really good that we would have never done Iron Gods or the Technology Guide in the first place. 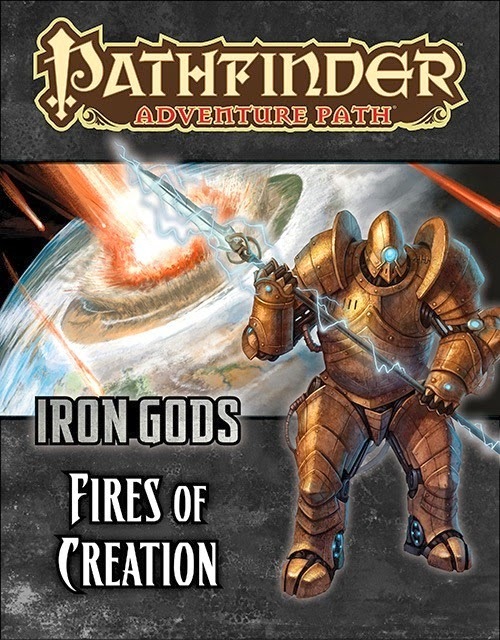 The fact that you say Iron Gods feels like a “natural expansion of the Pathfinder universe” is exactly what we were hoping folks would say to the new Adventure Path, not “oh, here we go—Paizo’s jumped the proverbial shark!” Of course, some folks are saying that (exactly that, in some cases), but the number of folks who are is a surprisingly (and delightfully) small fraction of those who, overall, are excited to see what we’ll be doing with the subject. RB: Do you think these releases pave the way for an adventure path dedicated to space travel and space exploration themes? JJ: Not really. They’ll certainly help in some regards, primarily in how we’d stock those spaceships and their crew with gear and powers, but the actual construction of a space-travel Adventure Path takes the science fiction genre in a very different direction than what we’re doing with the entirely planet-bound plot for Iron Gods. In fact, I’m not all that sure that a space travel Adventure Path is a good idea in the first place, unless we limited the plot to traveling to places we’ve already detailed so that we can expand upon rather than create content as we go. The hurdles and obstacles we’d have to navigate for a space travel campaign would be a lot more akin to those we faced with Jade Regent, not Iron Gods, and that means that if we were to do an Adventure Path on those lines we’d need to do a lot more support work in line with Gazetteers of strange worlds and the like. Could be a cool idea… but I’ve got a lot of other stories I want to tell before we abandon Golarion for an entire campaign. RB: What is the primary theme that runs through the story told in Iron Gods? JJ: As with all of our Adventure Paths, there’s several themes that guide the storyline of this campaign. The primary one, though, is an exploration of what happens when science and religion work together to accomplish a goal, rather than what happens when they fight. RB: During the course of Iron Gods will we get to travel to planets other than Golarion? JJ: Nope. The entire campaign stays on Golarion. We’re bringing those other planets here! RB: Wrath of the Righteous had an unprecedentedly apocalyptic "Beyond the Campaign" article that outlined the world-changing results of both the success or failure of the players. How large in scope will Iron Gods' post-campaign effect be? JJ: The weird thing with Wrath of the Righteous’ continuation article was that was the first time we did an article like that where the PCs were already at their maximums. At the end of Wrath, PCs are at the level limit and the tier limit. There’s really nowhere else for them to go and still be supported by advancement rules unless you start doing strange things like allowing them to go above 20th level or gain racial Hit Dice or gain templates. As such, we couldn't really do a “continuing the campaign” article… because that particular campaign really doesn't have anywhere else to go. The world changes significantly at the end of Wrath, and the story in that campaign concludes conclusively. What comes from it are opportunities for brand new campaigns. That, and the fact that the entire Adventure Path is so over the top, is why that “Beyond the Campaign” article was so huge. The repercussions of Iron Gods will be pretty big, but more on the scale of a typical Adventure Path, and it’ll have a more familiar “Continuing the Campaign” article at its end. RB: It's been mentioned that the Kasatha (a race originally from the Advanced Race Guide and recently reprinted into Bestiary 4) will be making an appearance in Iron Gods. Who created the Kasatha and how did they become a part of the development of Iron Gods? JJ: I believe it was Stephen Radney-Macfarland who invented the kasatha for Advanced Race Guide, as an example for how you could use the race building rules to create a race that had multiple arms. Of all of those races introduced in that book, the kasatha are far and away my favorites, and it made sense to have them step in as one of several alien races associated with the crashed ship in Numeria. The PCs will first start to feel a kasatha influence as early as the 1st adventure, and they’ll resurface now and then as the plot unfolds, not as members of the crashed ship’s original crew but as something… else. RB: Given their prominence in the story, what religion or religions have the most focus in Iron Gods? JJ: That’s not really an answer I can give without giving away some major plot spoilers… but I’ll do it anyway. The worship of Brigh (as goddess of invention) and Zyphus (as god of accidents) will both have a key role in parts of Iron Gods… but they are not the Iron Gods themselves. The Iron Gods are in fact a new category of entity—artificial intelligences—that have gained deific power and the ability to grant spells to their clerics. There’s more than one Iron God in the Adventure Path. They’re mostly evil and in the role of villains… but they’re not all evil or all villains. And that’s as much as I’m going to say about that for now! RB: Valley of the Brain Collectors is the title of Part 4 of Iron Gods. Given that the neh-thalggu have a strong connection to the mysterious Dominion of the Black, can we expect to see this nebulous antagonist force show up in Iron Gods in some capacity? RB: James, thanks again for having this interview with us. If you'd like to see more insights into James Jacobs' world as a developer or ask him questions about Pathfinder, check out the "Ask Me Anything" style Ask James Jacobs' discussion thread on Paizo.com.